Los Angeles County Sheriff’s Department City of Industry Station Special Assignment Team received a tip of possible illegal activity within a couple of warehouses on the premises. After approximately two months of investigating, the Special Assignment/Team Leader Deputy Nanquil authored a two location search warrant on the 1100 block of Fullerton Road, Industry. The search warrants were served Thursday, August 3, 2017, at approximately 9:30 a.m. A sophisticated indoor marijuana grow operation was discovered at both locations. 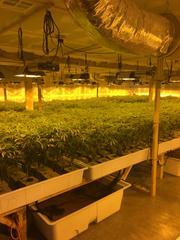 There were over 16,000 marijuana plants seized. The street value of the marijuana seized is over $50,000,000 dollars. No money or firearms were seized. Eight Asian male adult suspects are in the process of being arrest and booked on cultivation of marijuana. They are all residents of San Gabriel and Rowland Heights. Their ages range between 35-50 years-old. The suspect’s names are not being released at this time. **Industry Sheriff’s Station polices the cities of Industry, La Puente and La Habra Heights, in addition to the unincorporated communities of Bassett, Hacienda Heights, Valinda, East Valinda, West Valinda, and North Whittier.